We have an agreement with Wagon Hound Outfitting to use their how-to videos on ElkHuntingTips.Net. There is one on caping an elk in the field, packing quarters on horses, and quartering an elk in the field. Feel free to take a look at those. The Elk Hunting Video Contest for 2013 is complete! There were some really good videos submitted for the contest. You can see them all at the link above. The top three selected by the judges were: Switchback Outdoors, BigSkyHunterMT, and "4th weekend clips, Wyoming". Thanks to Jerry, Mardee, Shana, and Barry for scoring the videos! Hone up your video skills this fall and submit yours after the 2014 season is over. I learned a lot from these folks about how to video elk hunts. I'm looking forward to being more aggressive with my cameras during the rut! 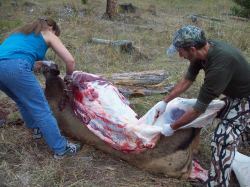 Send us the links and we will put them on the pages of ElkHuntingTips.Net. Elk language is complex and there is much to learn. Paul has done the research. These resources are so thorough, you will need to spend some time reading, listening and practicing over and over to improve your knowledge and elk language skills. You can take the field ready Playbook with you in your pack or cargo pocket. I recommend that you do. I certainly do. Of course, you'll need some elk calls to practice with. 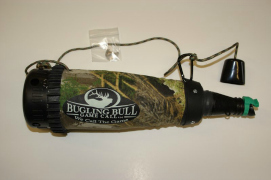 I have chosen to offer Rocky and Corey Jacobsen's Bugling Bull Game Calls on ElkHuntingTips.Net because I'm convinced they make some of the best sounding, user-friendly and most innovative calls on the market. Again, I pack and ship these to you myself and do not charge shipping (for delivery in the U.S.A.). ASAT Reaper Ground Blinds are Back! If you've spent much time on ElkHuntingTips.Net you know by now that I am a staunch ASAT camo believer. 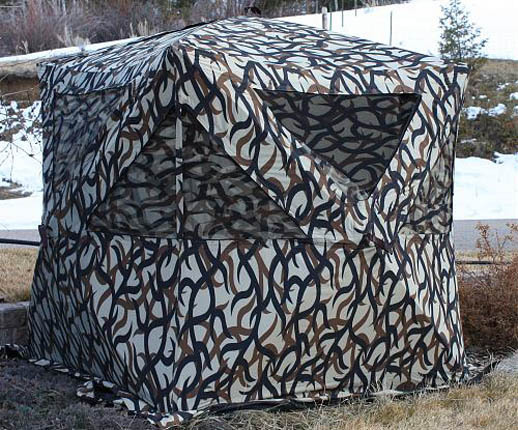 I just got word today from Rob at ASAT that the Reaper ground blind is back! There shouldn't be any hurry to get one... UNLESS you're turkey hunting this spring! I'll eat the shipping cost. Rob, the owner of ASAT, will pack and ship it to you from the warehouse 45 miles from here. We went to Boone and Crockett headquarters in Missoula, Montana the end of December and interviewed one of the official scorers. We video recorded the interview as he showed step-by-step how to do it. I am editing the video and typing up the instructions in concise, easy to follow wording, so you can follow the precise B&C process for scoring. I'll have that ready for you as soon as I can. I'll let you know when it is available via this newsletter. Another thing fall hunters should be starting up this time of year is getting fit for hunting. I'm training for my annual spring marathon and I'm doing the strengthening exercises listed on that page and more. I'll still eventually get tired chasing elk, but I don't want to be injured or sore while I'm doing it! If you have a chance to do some kind of shed hunting, it would be great fitness training for hunting! Please share your experiences during elk hunting season, including pictures on this page. Don't forget to upload some pictures, if you have them. Successful hunts don't always include an elk kill. If you had some "close encounters of the herd kind", share the experience! What did you learn? What would you do different? Happy spring from Garrison, MT!